by Janneken Smucker. (Young Center books in Anabaptist and Pietist studies). Johns Hopkins University Press, November 2013. 101 p. ill. ISBN 9781421410531 (cl. ), $34.95. For many, the image of a quilt brings forth feelings of family, tradition, and heritage. Its presence has the power to incite emotional joy and elicit nostalgia for simpler times or an easier way of life. At a very basic level, a quilt is seemingly humble in form and nature. 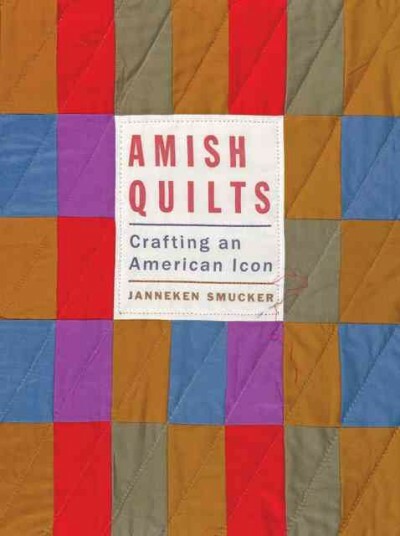 But in Amish Quilts: Crafting an American Icon, Janneken Smucker deepens our understanding of these celebrated handicrafts and successfully demonstrates the far-reaching importance of their cultural impact. Smucker, a fifth-generation Mennonite who learned quilt-making from her grandmother, received her Ph.D. in history from the University of Delaware and is currently assistant professor at West Chester University. Her academic pursuits have focused on textiles, social history, and American material culture, and she has curated and published extensively on these topics. For this definitive volume, the author has arranged her research chronologically, tracing the history of the quilt from Amish traditions of the nineteenth century to its near omnipresence in contemporary visual culture. Perhaps the most poignant theme in Amish Quilts is the issue of authenticity as it relates to Amish craftspeople and modern America. It surfaces as Smucker explores the rising popularity of Amish quilts in the mid- to late-twentieth century, and continues as she identifies how the idea of “Amishness” has been branded and sold by non-Amish businesses. The theme unfolds further as strong links are drawn between the cultural meaning of quilts and their visual nature to abstract art and the fashion industry. Amish Quilts: Crafting an American Icon is hard bound and sturdy, and its twelve chapters are flanked by a table of contents, endnotes, bibliography, and index. The extensive list of resources is largely comprised of published sources; however, the section of oral histories, related archives, and object collections is an informational treasure in and of itself. These primary sources are clearly the crux of the author’s research, evidenced by their prominence at the very beginning of her directory. While this volume is not meant to serve as a coffee-table picture book, its text is balanced with a generous and valuable amount of high-quality images that will surely grab the attention of academic and pleasure readers alike. Smucker’s engaging writing style and keen sense of American history and consumerism makes this book suitable for academic libraries that service art and fashion programs, textile collections and museums, and public repositories in communities where craft is integral to daily life.